On a short trip to Athens in January this year, I was able to spend a couple of hours in the city’s National Archaeological Museum. One of the highlights of the collection is the Antikythera Mechanism, a mysterious object which was found by sponge divers in the wreckage of an ancient Roman ship off the Greek island of Antikythera in 1900. It is the earliest known example of a geared mechanism, having been dated to around 150-100 BC, and its discovery changed our perception of mechanical technology in the ancient world. The Antikythera Mechanism is described in Chapter 1 of my book in a section on the evolution of geared mechanisms, one of the ‘building blocks’ that facilitated the development of calculating machines. I researched the Mechanism extensively during the writing of the book but had never had the opportunity to study it in person before. 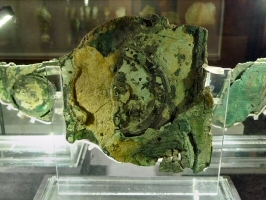 The curators have done a superb job of exhibiting the Antikythera Mechanism, a difficult task due to the calcified condition of the remaining fragments. 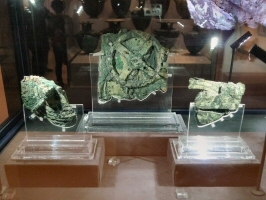 The extensive display includes both physical and computer-based reconstructions of the Mechanism plus explanatory material from the Antikythera Mechanism Research Project. Below are a couple of photographs I took of the exhibit during my visit. The left hand photo shows the three main fragments from the front. The right hand photo is a close-up of the largest fragment from the rear. This entry was posted in Uncategorized and tagged Antikythera, calculating machines, geared mechanisms on 11/06/2017 by Stephen J Marshall.